Living in the age of technology means we are always plugged in and attached to one electronic gadget or another. With computers, tablets, smartphones, laptops, digital cameras and PCs we are constantly keeping up with the media world at home and in the office. With that said, we must take proper care to clean and maintain our electronic devices to ensure their best performance. 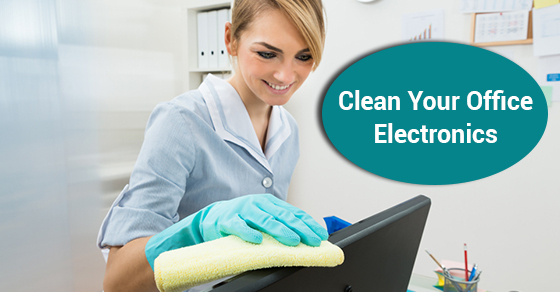 Whether you’re interested in starting the cleanup yourself, or wish to contact us about our office cleaning services, below you will find a few tips on how to keep your electronics going (and going)! When cleaning the outer shell of electronics, it’s best to clean them with a material that can remove the dust and dirt buildup without water or harsh cleansing agents. A microfibre cloth is gentle and safe on hardware and glass. Did you know that paper towel and standard tissue are too rough on electronic screens and surfaces and can cause scratches? Stick to the correct cloths, or leave it to us and our office cleaning services. For keyboards and other small crevices, compressed air is recommended to clean out trapped, small matter particles that may be clogging ports, stopping keys, or otherwise reducing function. If surfaces are sticky or stained, you may want to try a cotton swab with a diluted alcohol solution (50/50 water and alcohol) that will help wipe away mess. Never apply directly to surface, rather to cotton swab or cloth. Alcohol is a good cleaning agent for electronics because of it’s quick drying nature, reducing the risk of moisture in gadgets. Be mindful of liquids of any kind near electronic devices. For screens, never spray an agent directly on television or computer screen, rather moisten the cloth with specified screen cleaner and wipe away. You can also try the 50/50 solution mentioned above. It should be noted that devices should be powered down and unplugged for safety purposes when cleaning to reduce risk of shock. When hiring professionals for office cleaning services, be sure to inform them of the location of pertinent shutoffs, breakers, and what can and cannot be unplugged during cleaning. It is best to leave internal computer components to the specialists to avoid any loss of material or function, and it is best to leave all of your cleaning needs to our office cleaning services specialists.